Are we gaining profit or not? If no, what is happening? If the answer is ‘yes’ and the owners are not satisfied with the profit rate, then there is an opportunity to improve production. If the answer is ‘no’ then there is a lot of explaining to do. This is why Six Sigma is advantageous. It uses so many tools and methods that identify the problem root cause/s. It uses deep dive analysis that requires volume of data. Six Sigma project owners look at several factors also the cause and effect of a possible initiative. The more data gathered the more holistic and conclusive the report will be. Six Sigma experts when called to create a process or an initiative first identifies which among the two disciplined approaches are they going to use. Is it the DMAIC which stands for Define, Measure, Analyze, Improve, and Control? This is used to develop/improve existing practice. Or should the use the second approach – the DMADV which means Define, Measure, Analyze, Design, and Verify? This on the other hand is used to devise/design a defect-free procedure. Once they’ve identified which approach to use, they will now lay out activities for each phase and identify which tool to use in each phase. DEFINE is characterized by identifying project objective and client deliverables. and the benefits and objectives. First is the SMART rule. According to this rule, a problem statement should be Specific, Measurable, Attainable, Realistic, and Time-bound. Second is the 5 W’s (who, what, where, why, when) and 2 H’s (how often and how much/many). Regardless of which rule to follow it is imperative that problem statement should supply a representation of the extent of the problem while staying away from conclusions on the sources and resolutions. An example of a problem statement in a BPO (Business Process Outsourcing) set up having AHT (Average Handle Time) as a challenge. “From January to September 2009, Program Alpha of Account Beta has experienced continued increase in Average Handling Time from 1684 to 1988 seconds, respectively, which results in unsatisfied customers.” It is best also to present month-over-month data for easier understanding. After stating the problem statement, it is essential to compute for the goal to determine as to how long a certain action item will be implemented. BASELINE is identified as the average of the existing performance. ENTITLEMENT is defined as the top performance achieved in the span of a certain period. In the above scenario baseline is 1818 while entitlement is 1684. To compute for the goal we follow this formula 805 – (805 – 648) * 0.7 = 695 seconds. 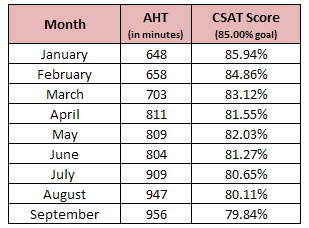 The graph below illustrates that the account’s AHT is on an increasing trend and way passed the goal. This highly affects their CSAT (customer satisfaction rate) and CPH (chats per hour). The longer the AHT the tendency to accept more chats is thinner. After calculating for the goal, it is also a must to compute for the business impact. This will justify as to how important the project is. This will also identify course improvement opportunities, project savings, and for how long a certain project must take effect. Using the same numbers above, business impact is computed as (Baseline – Goal) * 100 / Baseline. (805 – 695) * 100 / 805 = 13.66%. This shows that decrease in agent’s AHT will increase their productivity by 13.66%. After identifying the statement of the problem, the goal, and the business impact, project owners will create a roadmap. This is more like a calendar of activities, from the project launch up to the last day of implementation. The purpose is to monitor the actions being taken and what tools are used. By using this, project owners will be able to identify the impact of a certain action in a given period of time. The define phase also identifies the customers and their requirements. This is best identified by using CTQ and VOC gathering tools. CTQ, also known as Critical-To-Quality, is a tool that aids in interpreting client language into measurable requirements for a service or a product. This ensures that all characteristic of the need are known. This is best used when customer’s requirements are complicated, unspecific, and broad. This gives the team detailed specifications of the problem. Here is an example of a CTQ tree. When setting qualifications for CTQ it is a must that information should be based on the customer’s requirements. From a given statement of the customer, specifications should be set where there is an indication that the customer is no longer satisfied with either the service or the product. This is like asking yourself what made the customer unsatisfied. We create specific buckets to easily determine which particular parameter has the biggest impact. Another way of defining the cause of the problem is with the use of SIPOC tool. SIPOC stands for Suppliers are the one who provide service to end customers, Inputs are the available data, Process is the specific phase or procedure where problem originated, Outputs are the courses of action that needs to be done, and Customers are the clients or the customers or those who receives the output actions. 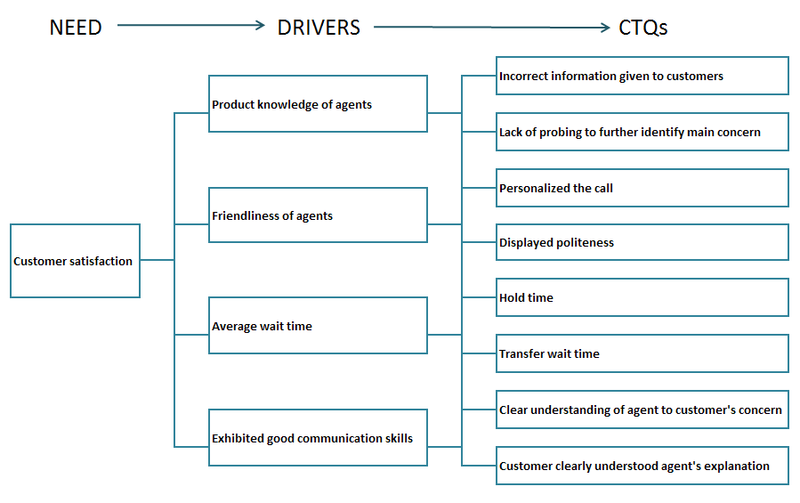 This tool illustrates the flow of service that is being provided by the vendor to the customer. Regardless of which tool to use in defining the problem, the most important thing to consider is that data used is comprehensive, current, and enough to make a sound conclusion. Define phase is the driver of the whole Six Sigma process. State it incorrectly and inaccurately, the whole project can or may lead to a wrong conclusion. Previous post: What is Six Sigma?